Hello all! I'm new (duhh). I am a uni student (well, half of a couple really) and I like coffee, as does my addict bf. We currently have a $49 Nescafe Dolce Gusto which I HATE. It's broken cos I dropped it when moving houses and I hate the fact that these seem to be the most expensive pods and it does not work with anything else, at all. So now that I went through a Costco supply of coffee pods, I am getting a new machine. I have $100 and nothing else will convince me to pay a cent more cos this is already a loooooot of money for a struggling uni student. I am open to either espresso of capsule machines, or anything really. I need my coffee not burnt, the ability to make weak ones for me and nuclear-strength ones for the bf, and we are milk coffee drinkers (caps, mostly....And yes, I drink soy, lactose intolerance is a b**ch). Oh and it has to make a lot of coffee, we have these keep cups that are the size of a smoothie cup...a lot of coffee cos yknow, uni. An ALDI Expressi pod machine - because I hear it runs Woolies Select pods too. A Sunbeam Piccolo espresso machine - because its a "real" machine by comparison to pods. Or this bargain thing off Catch of the Day called a Sheffield Espresso 4 cup (also only $50). 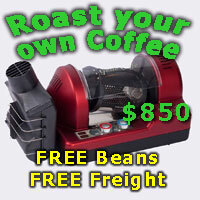 I am SOOPER new at coffee and really on a budget so aside from a cheapy machine I'm looking for a set-up that will not be costly to maintain ie no more $13 pod boxes for me. Through my mother, I am a fan of ground coffee from Campos or some other cafes in Alexandria (Sydney). Bf is a fan of strong things so he got a grinder and stovetop system for Xmas (since we already had a pod machine). He liked the pods though, but we can obviously do better. So if beans work out cheaper than ground, hey I'm open to suggestions. Also one more question - to buy in store, online or from the outlets of Melbourne where we may be travelling soon? Which is the cheapest? Thank you in advance and remember - I need help on a very firm $100 budget! Oh and I forgot to add - kitchen space is minuscule so something smallish would be ideal. If you're not wedded to espresso I'd consider an aeropress. Cheap, small, clean, makes good coffee. You will need a kettle and to heat the milk though. I second the 2nd hand machine. Or go for the aeropress or a pourover unit with a hand grinder. Grind quality beans. You can't go wrong. Can often pick one up in an op shop. My daughter recently confessed to buying a cheap pod machine. Says it not as good as what I make but better than instant.